This Sunday is the start of the Scotland Trade Fair, a 3-day event where over 500 companies will be showcasing their products. We are excited. Thousands of products will be on display at Glasgow’s SECC and thousands of people will be there to see them. We’re hoping it will be a great event for meeting new makers. Artisans of Scotland is a fairly new company and since we’ve launched we’ve been working hard to meet artisans across Scotland and we have built relationships with some amazing makers. It’s been a really fun journey so far and we’ve met some brilliant people. So to have a lot more of these people in the same place over 3 days is a great opportunity for us to find new products and hear new stories that should be told. We will be there to see what’s on offer and would love to identify some artisans that we can work alongside. What we are really passionate about is helping to celebrate their work and use our skills to offer new opportunities for people to access their products, like we’ve done with W E Scott and Son and the custom sporran builder. In our excitement we have run through the entire list of exhibitors. There’s so many amazing companies that we can’t wait to speak to, too many to name them all, but what we can do is tell you about 5 artisans that really caught our eye. We’ve started a love affair with pewter after working with our sporran makers. It’s such a lovely weighty material, tactile and warm (which feels like a stupid thing to say about a metal). We really love the finish it offers and all the possibilities pewter gives. So we were really excited when we read about Pewtermill crafts. That excitement grew even more when we saw their products. They are a Ayrshire based company that make some wonderful jewellery, accessories and Quaichs. Their work references traditional styles as well as their own contemporary designs. How cool are these Highland Coo cufflinks. As well as great products, we’re sensing there’s a great story to be told. The company formed 35 years ago after the founder won a competition run by the Design Council to improve the quality of Scottish gifts. It will be great to hear the full story and see their products in the flesh. We came across Rarebird design a few years back when one of our team, Ben, was at a reception in China discussing investment between our two countries. Each of the attendees were handed a gift presented in a gift bag. The gift quickly became of secondary importance to the amazing tweed bag it had been presented in and Ben brought it back to the office, excited to show it off. The quality of craftsmanship and attention to detail is outstanding. From the wonderful Harris tweed herringbone material to tiny little finishes, like the brown leather tag, we were sold and we have admired the work of Rarebird ever since. They have a collection of really wonderful products with their flagship being this great tweed handbag. Never having had the chance to meet, we’re looking forward to seeing their full product range and speaking to the makers behind this great collection. This is a lovely romantic concept and is a special way of celebrating one of Scotland’s finest industries. Keeping alive the story of ‘The Angel’s Share’ these artisans bottle that share in a small glass angel to make a really unique and special gift. The intricacy of their craft looks amazing and they have compiled a really special range of products. As well as their Angels they make Whisky Droppers like the one below and some great glassware and Whisky scented candles. It’s so brilliant to see innovations in traditional industries and with personalisation and customisations available there’s so much scope for creating something special. We’ll drink to that. There are a number of jewellers at the show and it will be great to have the chance to view all their work up close. When we were looking at the exhibitors one stood out for us, Kelly Munro. Her work is absolutely stunning. 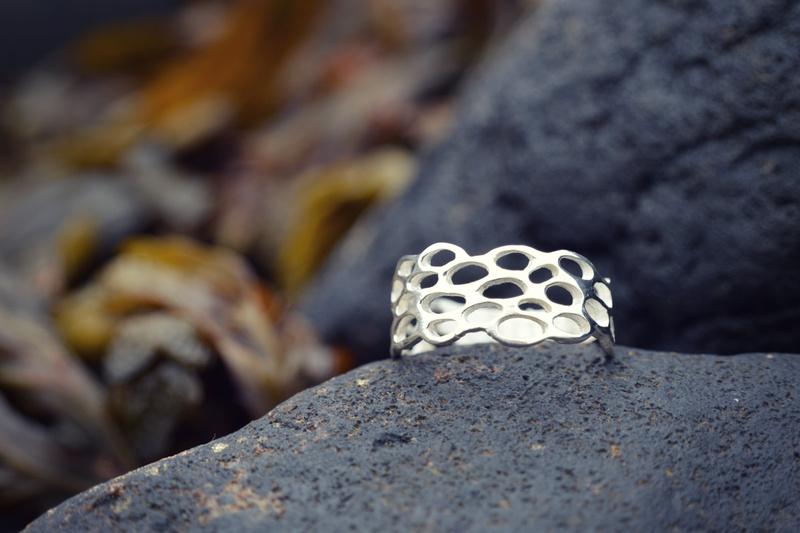 Amazing pieces inspired from her hometown Wick that really capture the textures and sites of the coast and the sea. It’s amazingly impressive to see the forms that she can create. She works in silver and wood and we were blown away by how her piece’s can appear incredibly intricate but beautifully simple at the same time. This ring is just one example of that work, but her whole collection echoes this. We’re looking forward to hearing more about her work and if there’s a possibility we can celebrate her work at Artisans of Scotland. Last on our list but by no means least is Lucy Donnell, a luxury Scottish knitwear designer. All her products are made in Scotland from 100% Geelong Lambswool, spun in Lanarkshire. These really are a celebration of what Scotland has to offer, both in the material and the amazing design talent on display. Really carefully selected colours come together to create a fashion and home accessory range that look incredible and we can’t wait to pick it up and hold it as it all seams so tactile. The snood and glove set above are just one example of Lucy’s work, with the range consisting of fashion accessories like snoods and scarves to homewares like cushions and hot water bottle. Really lovely wares that it’s great to see being designed and made here in Scotland. So there you go, there’s our round up of 5 of the exhibitors that we are particularly excited to see. I’m sure there will be many more that will catch our eye. It’s events like this that make what we are doing so interesting and fill us with excitement for what’s ahead for Artisans of Scotland and the future of ‘Made in Scotland’. Hopefully it will be a really fun couple of days in Glasgow. The Scotland Trade Fair runs from the 24th to the 26th of January and you can find out more on the Trade Fair website. Maybe we will see you there.